Here's a neat gift basket idea for Valentine's Day or Easter! 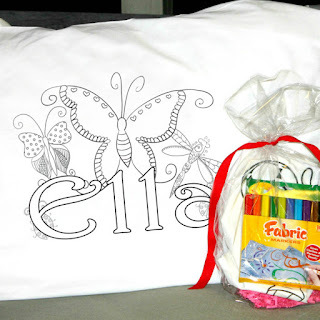 Right now these Personalized Coloring Pillowcases are $8.95 (Retail $18.95). Featuring our popular line of color-it-yourself pillowcases with 30 design options. These come personalized and heat pressed ready to go for your little one to color with fabric markers or fabric crayons (markers not included but can be purchased at Walmart, Target or a local craft store). Kids love to color! What a fun party take home gift or even a gift for the birthday boy or girl! -Pillowcases are a cotton/poly blend and are standard pillowcase size. Each pillowcase will come personalized with your choice of design. -Please remember, the ones that are colored are only to show what a typical finished product looks like. You will receive the black/white design ready to color! -Up to 15 characters (including spaces) for name to keep the design looking best. If you would like the design only, just put "N/A" on the personalization line. -Your personalized design transfer will come heat-pressed onto a white pillowcase. -Custom pillowcases are made in-house.